On 19 September at the Birmingham Hippodrome, 130 guests were treated to a fantastic evening of fun and entertainment for the West Midlands Volunteer Awards ceremony. These awards were established to highlight the crucial work and invaluable efforts made by volunteers to the museum sector. One of these guests was Nick Lambert, Visitor Engagement volunteer from the Pen Museum. Nick has played an instrumental part in the development of the museum’s shop, helping to develop a good range of products for all our visitors. But above all, his warm welcome and introduction to the museum have helped ensure that hundreds of visitors have left feeling inspired and intrigued about such an important part of Birmingham’s industrial legacy. 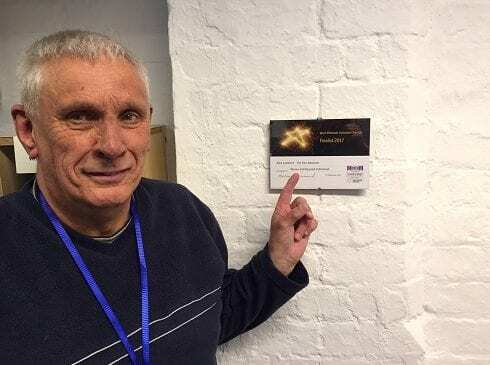 Nick’s performance and contributions were recognised by the West Midlands Museum Development team and he was put forward as a finalist in the ‘Above and Beyond Individual’ category. The evening began with a drinks and canapés reception before the guests took their seats for evening’s first performance by Talking Birds. Magicians Morgan and West entertained and bewildered the audience before the interval. Guests enjoyed a selection of dishes before returning to the auditorium with dessert and a second helping of Morgan and West. The evening concluded with a bang as Beat Mission and Brum 2 Birmingham showcased hip hop and samba! Although Nick didn’t win this time, reaching the final was a huge achievement that showcases the important and vital role our volunteers play in bringing Birmingham’s pen trade to life for the public.